Miniature garden gazing balls or gazing globes are easy to make in dollhouse scales or for a miniature garden scene. We've set out instructions for three different ways to make tiny gazing balls for indoor or outdoor use. The photos in these instructions show gazing balls made to fit with a 1:12 scale dollhouse doll, but you can adapt the method to work with fashion doll scale, garden railroad scale or 1:24 scale, or smaller scales using beads or small glass marbles. The gazing globes are a great way to draw the eye into a miniature scene, and you can choose balls which reflect or add to the color of your setting. If you choose materials carefully, this is an easy project for a child. Use suitably sized marbles or plastic ornaments and safe glues if children are working on this project. Gazing globes or gazing balls made of mirrored glass was popular in Victorian gardens. To make them in miniature, look for a glass or plastic Christmas ornament with a mirror or clear finish. If you plan to set the gazing ball outside, try to find a mirrored plastic ball or one where the color is set in the plastic, not painted on as a coating. In the photo shown here are some common ornaments that can be used for miniature gazing balls. They include a cluster of clear plastic ornaments from the dried flower section of a craft store, tiny silvered glass Christmas ornaments, and wired ball ornaments used for decorating gifts. Other items that can be used include beads, plastic 'bubble' ornaments, and clear or crazed glass marbles. Look for a ball which will be the equivalent of six inches to one foot in diameter in your chosen scale. In 1:12 scale this would be 1/2 to 1 inch in diameter. Most gazing balls are set up in a garden to sit at roughly table height so the viewer can look down into the ball. When looking for support for your ball, you will need a tube roughly 30 inches in scale. In 1:12 scale this would be roughly 2 1/2 inches long. The end of the tube will need to be the correct size for the base of your globe ornament to sit inside the tube to secure the gazing ball. For our gazing balls, we found clear pen caps and small clear tube containers (the kind used for small beads) which would work well. Check your recycling bin, or your junk stash for items you might want to use. Check that your chosen ball will fit into the stand so that it can be glued in place securely. Tripod stands can be built for fairy garden globes using wire wrapped with kraft paper or twisted 'vines'. Gazing ball stands can also be easily made from foam, coated with gesso and paint to make faux stone, or from small plant pots, or pillars of stones, flat beads or buttons. Many brands of small seed beads, as well as blades for craft knives, are sold in small cylindrical plastic containers. If you have any of these in your stash, they can be used to make interesting bases for fairy or dollhouse gazing balls. This is an easy project for a child. To make our gazing ball stand, we used an empty rigid plastic bead container shaped like a tube. We cleaned out the tube, filled it with a mixture of bits of old jewelry, sequins, rhinestones, and assorted beads, set the globe into the top with glue to seal the opening, and covered the cap threads on the outside of the container with a section of the ribbon. You could also cover the threads with a decorative hair elastic wrapped around the top of the tube before you glued the ball/globe in place. Colored sand, dried or silk flower petals, bits of moss, cones, tiny shells or pebbles, all kinds of things can be used to fill the tube for a fairy garden gazing ball. We think of fairies as collectors of tiny decorations, so any colorful bits are fair game. If you will be setting your gazing ball in a living miniature garden or out of doors, use a silicon glue or other waterproof glue to seal the gazing ball into the top of the tube to prevent water or dirt from getting in. Plastic pen caps which fit the base of your chosen ball can usually be easily modified to make a miniature gazing ball stand. Clear caps give you the most options for decoration, but any suitable length of the cap can be used. To make the cap into a tube shape, use a razor saw or a craft knife or kitchen shears to trim off the plastic pocket tab from the cap. You can use sandpaper to remove any excess plastic, polishing the plastic with automotive finishing pads. If the top of the pen cap is curved, sand it off to a flat area for a better glue bond to a button or plastic shape as a sturdy base. Remove all stickers and projections from the plastic, unless you decide to incorporate them into your final design. If you use a plastic pen cap, or section of plastic rod or straw for a miniature gazing ball stand, you will need to close the base and give it a wide area to balance on in your miniature garden. If you have sanded any curves flat on the top of your pen cap, you can glue the top of the cap to a button, flat bead, or flat charm (we used a plastic snowflake) to help keep your gazing ball from tipping over. You could also glue a piece of wire or wooden dowel into the tube if you want to secure it by pushing the wire down into the soil in a garden or garden pot. If your gazing ball will be set outdoors or in a pot with living plants, make sure your glue will stand up to moisture. Plastic cement, hot melt glues, and silicon glues will usually work to glue the base to the pen cap. Once you have attached a base to your plastic tube or pen cap, if the stand is clear, you can fill it with a wide variety of materials to create interest below your gazing ball. Examine your stash for bits of ribbon, discarded jewelry parts, beads, glitter, sequins, chains or other items. You can also use glaze pens on the inside (or outside if the gazing ball will not be near moisture) or Pebeo Glass Paints applied to aluminum foil inset into the clear pen cap. Fill the base with your chosen materials. Shiny things will show up better in a garden setting but may compete with plants. When you have the base filled to your liking, glue the ball to the opening at the top of your garden ball stand and set it in a prominent place in your miniature or fairy garden scene. Although Victorian garden gazing balls were usually set on a simple stone plinth, stands for fairy gardens can be much more whimsical. Especially where children are concerned, fairies seem to be attracted to shiny metal or gem-like objects and colored films. To decorate our fairy garden gazing globe stand, we used metallic glitter flakes, metallic microbeads, clear bugle beads, heart-shaped rhinestones, micro glitter, thick glue, and square iridescent sequins. If your fairy garden gazing ball will be set outside or into a planted container, make sure your chosen materials and glue will withstand moisture and dust. Nothing is worse than a gazing ball which has lost its sparkle and can't be cleaned. 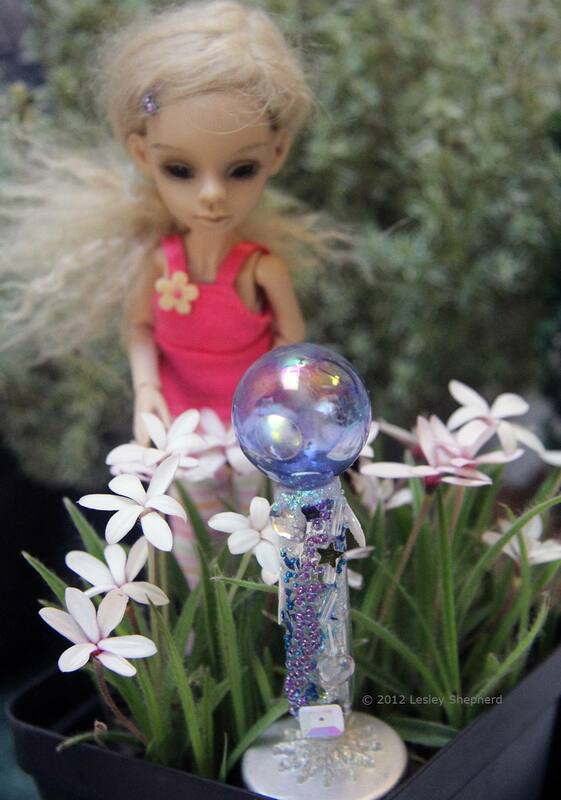 If you could only find a colored pen cap to make your fairy garden gazing ball stand, don't despair. You can easily cover the outside of the pen cap with your chosen decorations to make a suitably glittery stand. You can also use this method on the exterior of a clear container or pen cap to make a 'watery' or icy looking stand for a special fairy garden effect. To cover the stand you will need a clear drying glue which is thick enough to hold your chosen materials, and which will withstand moisture if necessary. Silicone glues or thick rubbery plastic cement will usually work well, especially if they are rated for moist conditions. Plan how you will decorate the outside of your container and how you will support it as you decorate it. Clamping it into a panavise or some other work clamp works well, or you can set the cap on the end of a pen and set the pen into modeling clay or a piece of floral foam. Use a wooden toothpick or the glue applicator to apply small amounts of glue to one section of your cap at a time, using tweezers to set your chosen decorations in place. If your glue has a fine applicator tip, you can apply swirled lines to your cap and lay in a line of a particular material, then allow the glue to dry and apply the next line for a different decoration. Experiment with a range of items, repeating colors or spreading large shapes around the sides of your gazing ball stand. When your stand is fully decorated, attach the base as shown in the previous step, and glue the ball to the top of the stand. With the gazing globe stand decorated and the ball attached, you want to find the right place to show off the gazing globe. Look for a site in your garden or container garden which will catch light. Reflected light will draw attention to your globe. You should also plan on viewers who will want to see if the globe reflects their face. Everyone seems to want to peer into a gazing ball, no matter how tiny, so make sure viewers can easily peer into the globe. Finally, if you have figures to set into your garden, try to position them so it appears they are checking their reflections in your globe. Make sure you allow for the growth of your plants. This gazing globe has been set in front of a clump of rhodohypoxis so that the flowers will not hide the globe when they appear. Have fun experimenting with gazing globes in real or artificial gardens. These are wonderful placed beside a miniature fish pond or pool made from sheet plastic.